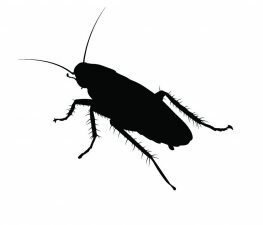 Cockroaches 101: Stuff you never wanted to know about roaches, but really should. Asian Roaches, German Roaches, American Roaches, & Cuban Roaches. It's mind boggling and that's just a few of them! You've heard the phrase, "Knowledge is Power" ...well, maybe that doesn't really apply here, but it sure helps to understand the how, why, what and where of the creepy creatures that frequently invade our homes. The German cockroach is the most common species of the cockroach. These are the ones you really don't want to, but often find in your kitchen or bathroom. German cockroaches can breed at a rate of up to six generations per year. They can fit through an opening as small as 3/8 inch in width. They are ½”-5/8” long, light brown to tan, with two dark, almost parallel stripes located on their backs, just behind their heads. German cockroaches will feed on almost anything, including soap, glue and toothpaste. German cockroaches prefer to live in warm, humid places close to food and moisture sources. They are frequently found in residential and commercial kitchen environments, and bathrooms. They are good hitchhikers: commonly introduced to your home in cartons, boxes, & grocery bags. German cockroach control is dependent on customer interaction, population level, and dispersion of the colony through previous treatment attempts. 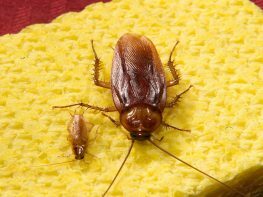 Our German cockroach treatment is a specific, corrective treatment, not included in our Preventative General Pest Control Service. In order to reverse the problem and interrupt the life cycle, a combination of non-repellent products, baits and Insect Growth Regulators are utilized. If follow-up treatment is needed or recommended, the price will be ½ of the original treatment up to 90 days after original treatment date. Asian cockroaches can often be confused with German cockroaches because they look almost identical to one another. 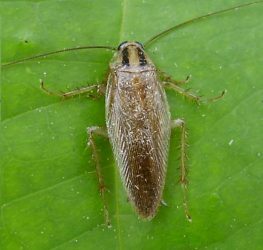 However, Asian cockroaches are a slightly lighter brown color than German cockroaches and have slightly longer and narrower wings. Perhaps what most separates the Asian cockroach from the German cockroach is its ability to fly whenever they are disturbed, which German cockroaches rarely ever do. Asian cockroaches actually prefer to live outdoors, and on human properties they are reported to be regularly found out on your lawn or garden, especially in shaded mulched or composted areas. When they come into the house it’s usually by accident because they are attracted to our home lights at night. This photo best demonstrates the size of the American roach compared to the German roach. 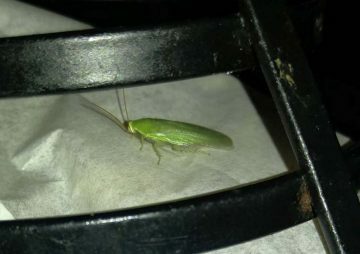 American cockroaches live primarily outdoors, but it’s not uncommon to find them inside a structure. 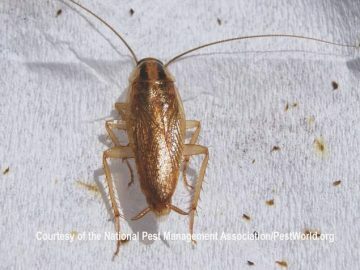 In the Southern United States, American cockroaches are often spotted in shady, humid areas like flowerbeds and underneath mulch piles. During summer months, they can also be found outdoors in yards and alleys. Found in Cuba and the Caribbean, and along the Gulf Coast from Florida to Texas. The females can grow up to 24 mm and the smaller males are 12 to 15 mm long. It is winged and a strong flier, pale green to yellowish green in color, with a yellow line running up the sides. The nymphs are brown or black in color and are burrowers. It is usually an outdoor species and is rarely found indoors, so is not considered a pest. The adults can often be found in shrubbery, trees, and plants. The young can be found under logs and other debris. It is often attracted to both indoor and outdoor lights and it is mainly a nocturnal species. Saw this guy at a local restaurant. Kind of makes you wonder how many times you've seen one of these and didn't realize it was a roach doesn't it?